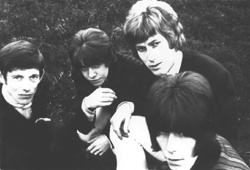 The Herd established itself as a good Club/Ballroom band. We played The California Ballroom, Dunstable where there was a balcony over the stage which enabled disgruntled punters to pour their beer onto the hapless musician below, or indeed, hurl their glasses onto the stage. When the Herd played the California, there were two stages, a small one over the far side of the Ballroom and a large one, situated between the main doors and therefore immediately below the Vista Bar! The small stage was eventually dispensed with and the large stage was moved to the left hand side by the Hillside Bar. This allowed direct access to the dressing rooms. Not only would the Herd and their ilk have had to suffer the indignity of having drinks poured on them but they would also have had to leg it across the dance floor to get to the stage in the first place.